Septic Pumping Repairs Erin | Home | Ed Peavoy Septic Service Inc.
Avoid Nasty Overflow: Keep things running smoothly with routine pumping and cleaning. For more than 30 years, family-owned and operated Ed Peavoy Septic Service Inc. has been serving residential and commercial clients with reliable septic tank cleaning, pumping, and repairs. Our team of experienced, knowledgeable, and professional holding and septic tank technicians make it their mission to service your property thoroughly, while educating our clients to avoid disaster and costly repairs down the road. Regular maintenance of your septic system is highly recommended. A well-maintained septic tank reduces the risk of catastrophic failure, which can lead to your system backing into your house. Available year-round, Ed Peavoy Septic Service Inc. offers a comprehensive range of services to keep your septic tanks in tip-top shape. Our power washing services keep your beds free from sludge and other build-up while routine inspections identify baffle issues so you can repair or replace them before serious issues arise. Stay safe. Let us handle work best left to professionals. We keep you in the loop so you can hold septic problems at bay. At Ed Peavoy Septic Service Inc., we value the importance of education. We make a conscientious effort to provide guidance for our newer rural customers who may not be as familiar with septic tank systems and how they function. We provide all the basic do’s and don’ts, the when and why of septic tank systems, along with maintenance procedures to ensure our customers get the most out of their systems with fewer preventable repairs along the way. We don’t take any shortcuts and only pump when necessary. 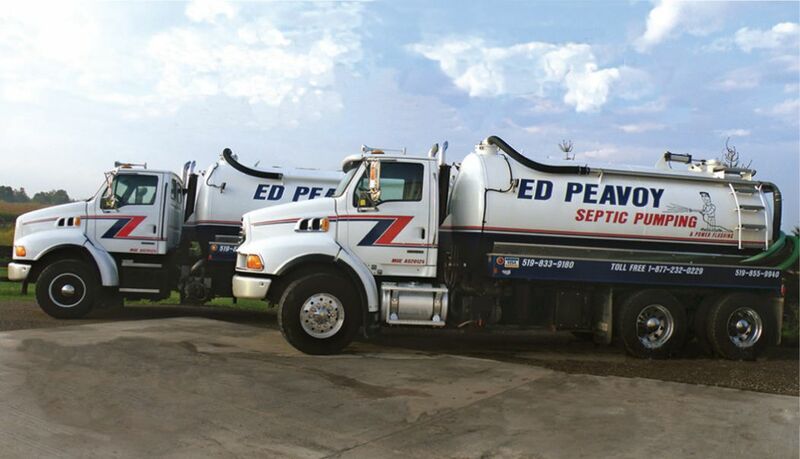 When you choose Ed Peavoy Septic Service Inc., you can rest assured you are getting honest, knowledgeable and dedicated service. In the unlikely event that we can’t fix a specific problem, we’ll put you in contact with specialists who can help you out. Get in touch with us today for service.